In honor of National Oatmeal Muffin Day (yes, you heard us, there's a day to celebrate the yumminess), we wanted to share our favorite recipe. These morning glory muffins are perfect for fueling busy holiday mornings, and are great to have on hand to grab-n-go as you run out the door. These muffins contain oatmeal, dried fruit, and nuts so they're packed with good stuff. In honor of National Oatmeal Muffin Day (yes, you heard us, there's a day to celebrate the yumminess), we wanted to share our favorite recipe. These morning glory muffins are perfect for fueling busy holiday mornings, and are great to have on hand to grab-n-go as you run out the door. 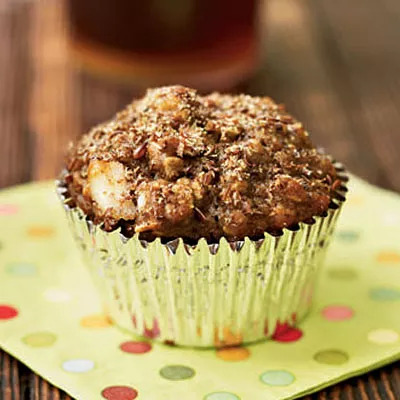 These muffins contain oatmeal, dried fruit, and nuts so they're packed with good stuff. Oatmeal is a superfood, of course, meaning it has extra health benefits. Dr. Oz has named oatmeal as one of his favorite healthy foods--it's hearty-healthy, full of fiber to ward off hunger, and has been shown to up endurance...perfect to fuel a workout or a day full of fighting crowds at the mall while holiday shopping! Feel free to add your favorite dried fruits. Round out your meal with fat-free yogurt and fruit. Ingredients: Whole wheat flour, all-purpose flour, oats, brown sugar, wheat bran, baking soda, salt, fat-free yogurt, banana, egg, dates, walnuts, dried pineapple, and flaxseed.